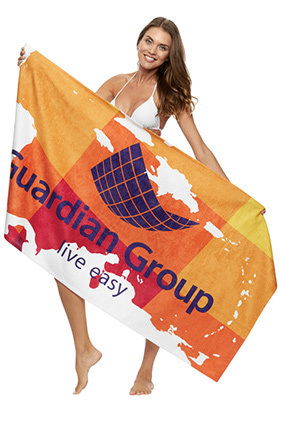 This soft and absorbent cotton loop terry beach towel reverses to an ultra smooth microfiber optimized for sublimation printing. The promotional possibilities of this towel are limitless. Make a statement in full color with edge to edge photo prosess printing in stunning detail and vibrant colors. Made of 35% cotton/65% microfiber polyester terry fabric. 9.5 pounds per dozen.